Before booking your vacation, we recommend validating ownership information on all VRBO listings . Deal directly with the owner, not a rental agency listing for an owner. This adorable home "PALM PARADISE BEACHESCAPE" is in a fabulous location south of Highway 30A, convenient to the nearby bike path, shops, and special activities and restaurants at Gulf Place and Seaside. Style, beauty, and spaciousness combine to make "PALM PARADISE BEACHESCAPE" a much sought after beach home for a relaxing and memorable family vacation. Decorative details include one-of-a kind artwork, bamboo flooring, and impressive furnishings. Enjoy the wonderful Gulf views from both the third floor covered porches and living areas. There are bedrooms on all floors (2 kings, 1 queen, 2 full/twin bunks), a great room on the second floor (1 queen sleeper sofa), and sitting room on the third floor (1 queen sleeper sofa). There is also a third floor sundeck for private sunbathing or watching the sunset. There is a separate laundry room, TV's in every bedroom, a fully-equipped kitchen, a Nintendo Game Wii, DVD player, games, videos, and beach/pool toys. There is parking for 4 cars. The beach access is just steps away (200 yards) with no busy roads to cross and has LIFEGUARDS, showers, restrooms and a picnic area. When you are not at the beach, you can relax in the beautifully landscaped yard that contains a large 28'X14' swimming pool and a palm tree shaded area that is spacious enough for lawn games. Walk across the street to the fresh seafood market and grill your dinner on the natural gas grill provided for your use. We fell in love with the Beaches of South Walton and enjoy sharing it with our family, friends, and guests. Aside from the sugary white sands and the crystal clear water, our house sits in a great neighborhood of Gulfview Heights. Our beach access does not get crowded. We are with in a very short walking distance of shops, restaurants, bars, and an ice cream shop. Bath towels are provided. Guest must bring their own beach towels. There is sitting for 6 at the dining room table, 4 at the kitchen counter island. There is additional seating on the decks and patio. We also provide a foldable card table and 4 chairs. Perfect lawn fro Bocci Ball. 3rd floor balconies have terrific gulf views. We have stayed at this house before with family and friends. It is the perfect location so easy to walk to the beach. We have stayed in the Destin area for years and this house is perfect! Enjoy having lifeguards at the beach and love how it’s not to crowded at the beach . The house is fully stocked even beach chairs. The owners are so helpful. beautiful house, great location, plenty of space! The owners were helpful in answering our questions and meeting our needs. would def consider renting this property again. Thank you for the great review. You were wonderful to work with as well. We look forward to you coming again next summer. The location is perfect to walk to the beach or several eateries within the area. The accommodations were above our expectations in the sense the house was clean, no maintenance issues, & several amenities available. Our family returned for the second summer to this home. It was very comfortable for our group of 13, with a well stocked kitchen and just a short stroll to a lovely public beach. The private pool is larger than most, and the outdoor shower was a plus Walked to Goatfeathers to pick up steamed shrimp for supper one night, which was yummy! We hope to return again next summer! Palm Paradise is a beautiful home with plenty of room. The pool is a great size and the area around it is nice. There are also things for the beach stored outside that can be used and there are games in the house. The kitchen is well equipped with anything you would need for cooking. We stayed in this house 15 years ago and it is still just as nice as it was then. We could not have had a better week. You will not be disappointed with this home or the area it is located in. House is in a great location close to beach! 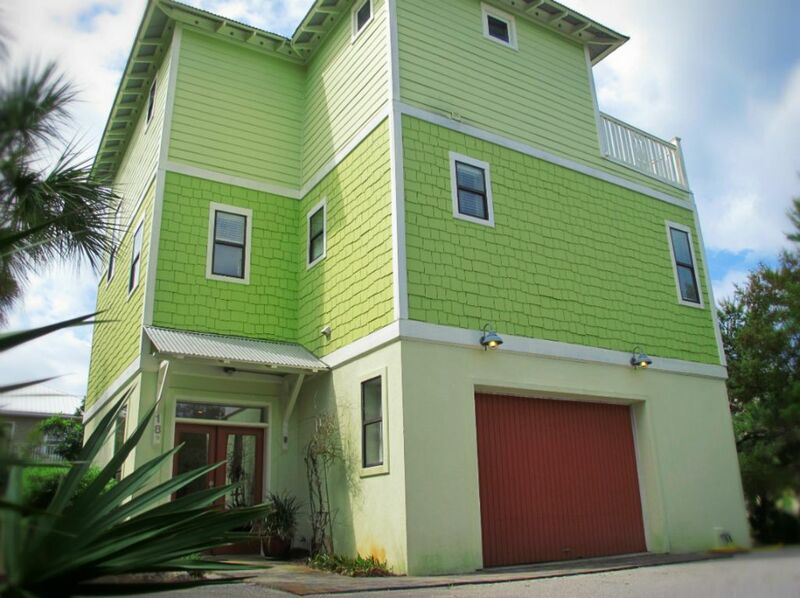 House is just a short drive to Destin where there are endless shops, food and entertainment. Close grocery stores. Had all the items supplied that we needed during our stay. Great house that we would love to stay at again. Highly recommended! We do offer a full cancellation refund less the VRBO fees if and when the house re-books. Pool heat maybe requested at an additional charge of $200. There is a $500 additional rental fee for the premium holiday weeks of July 4th, Thanksgiving, and Christmas. For direct questions on pricing, fees, and discounts call owner at 419-566-3007.